Home > Topics Why only white on their wedding day? Why only white on their wedding day? Doesn't matter if you literally never wear white in your normal, everyday life. Doesn't matter if you know, deep in your heart, that you are embarrassingly clumsy and WILL drop something on all that pristine white satin. Wedding dresses are white, and only 'unconventional' brides wear another colour. Which is a silly social convention to uphold so strictly, really. Because wedding dresses being white is actually a fairly recent fashion choice. See, just over 176 years ago red was the most popular colour for wedding gowns � probably because of all its �roses are red� romantic connotations. White dresses were worn occasionally, but its associations with mourning prevented it from being the preferred wedding option. Even when Mary Queen of Scots picked a white dress, she was widely slammed for being inappropriate simply for choosing a white gown. When her husband died a few years later, she was accused of cursing him by wearing mourning clothes to the wedding. Oh dear. It wasn't until Queen Victoria decided to f*** the trends and wear a white gown that the style became a mainstay of the whole wedding thing. 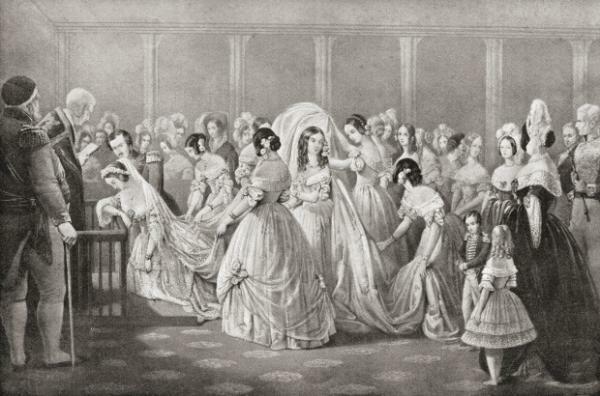 On February 10, 1840, Victoria wore a lacy white gown with an orange blossom wreath for her wedding to Albert despite members of the court questioning her colour choice. The dress turned out to be a massive hit, and soon other women were choosing Victoria-inspired dresses for their big day. Just a few years later, popular women's magazine the Godey's Lady Book proclaimed that custom has decided, from the earliest ages, that white is the most fitting hue, whatever may be the material.